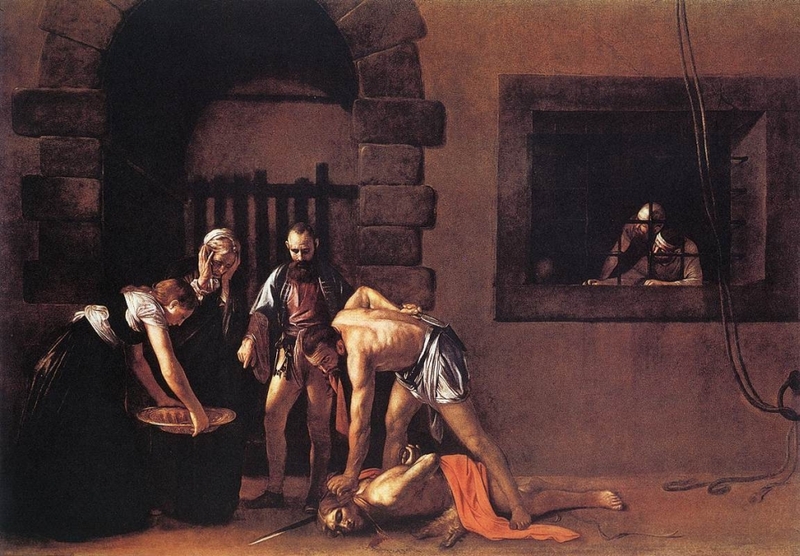 'The Beheading of Saint John the Baptist' (1608) by Caravaggio. Trust A Fox has thematic parallel with How Do You Sleep. Jesus called Herod a fox; this, coupled with the repeated "cut your face up" lyric suggests the beheading of John the Baptist. Herod married his half-brother's wife, Herodias, and had John the Baptist imprisoned and finally beheaded for his condemnation of the marriage. Meanwhile, Jesus' reputation was growing - He drove out a demon, healed a bleeding woman and raised up a dead girl in Luke, Chapter 8. Now Herod, the tetrarch, heard of all things that were done by him; and he was in a doubt, because it was said by some; That John was risen from the dead: but by some others; that Elias had appeared: and by others; that one of the ancient prophets was risen. And Herod said: John I have beheaded: but who is this of whom I hear such things ? And he sought to see him. The same day there came some of the Pharisees, saying to him: Depart, and get thee hence: for Herod hath a mind to kill thee. And he said to them: Go and tell that fox: Behold I cast out devils, and do cures, to-day and to-morrow, and the third day I am consummated. Nevertheless I must walk to-day, and to-morrow, and the day following: because it cannot be that a prophet perish out of Jerusalem. Jerusalem, Jerusalem, that killest the prophets, and stonest them that are sent to thee, how often would I have gathered thy children, as the bird doth her brood under her wings, and thou wouldst not ? Behold, your house shall be left to you desolate. And I say to you, that you shall not see me till the time come, when you shall say: Blessed is he that cometh in the name of the Lord. The use of the word 'fox' should not be taken in the modern sense of the word (sly, cunning); rather, Jesus was commenting upon Herod's ineptitude, or inability to carry out his threat. Jesus longed to gather Jerusalem as a mother hen gathers her chicks under her wings. There is a phrase, 'Don't let the fox guard the henhouse', meaning not to assign a job to someone who will then be in a position to exploit it for his or her own ends. You can’t trust a fox - he'll find a way to do you in - and Herod Antipas was such a creature. We also know that Jewish rabbis routinely referred to people who were worthless and insignificant as a 'fox'. Herod Antipas was a tetrarch, which was a subordinate or dependent prince. When his father, Herod the Great died, his kingdom was divided into four parts and the Roman emperor named Herod Antipas the tetrarch over the region of Galilee, Jesus' home. Herod was in effect a puppet prince, a pompous pretender who was merely doing the bidding of the Roman emperor. Herod might see himself as a lion, an imperial potentate, but in reality, he was just a fox. But Pilate hearing of Galilee, asked if the man were a Galilean ? And when he understood that he belonged to Herod's jurisdiction, he sent him away to Herod, who himself was also at Jerusalem in those days. And Herod seeing Jesus, was very glad, for he was desirous of a long time to see him, because he had heard many things of him: and he hoped to see some miracle wrought by him. And he questioned him with many words. But he answered him nothing. And the chief priests, and the Scribes, stood by, earnestly accusing him. And Herod, with his soldiers, despised him: and mocked him, putting on him a white garment, and sent him back to Pilate. And Herod and Pilate were made friends together that same day: for before they were enemies one to another. Instead of the fox guarding the hen house, that week in Jerusalem, the hen willingly entered the fox's lair.